Nicole Escudero, CPA, CFE, CIRA is a Senior Associate at Yip Associates and has over four (4) years of experience in forensic accounting, fraud investigation and litigation support. Ms. Escudero focuses primarily on Chapter 7 and 11 bankruptcies, litigation and forensic matters, and works in the review and analysis of corporate books and records, bank account records, contracts, vendor files, investor files, financial statements and tax returns, financial investigations and tracing of funds. She also assists with operations during the pendency of Chapter 11 proceedings and the reorganization process. Ms. Escudero graduated from Florida International University where she earned a Bachelor of Accounting with a double major in International Business. 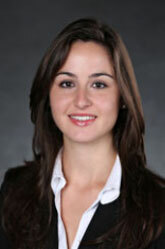 She is also a graduate of Florida Atlantic University where she earned an Executive Masters in Forensic Accounting. Prior to joining Yip Associates, Ms. Escudero gained valuable experience at a local accounting tax firm where she provided professional services to clients, including the preparation of financial statements, payroll returns, sales tax returns, and corporate and individual income tax returns, as well as maintaining the firm’s financial affairs.